Center for Space Information Technologies (CKIT) was created in 1999 with the aim of providing information support for various space projects. The Center offers integrated solutions for the design, testing and exploitation of the onboard information complexes for spacecrafts as well as information support for space-based experiments of different nature. CKIT is located at approximately 1 km from the main IZMIRAN facilities and is connected to them and Internet by an 11 Mbit/sec wireless link. 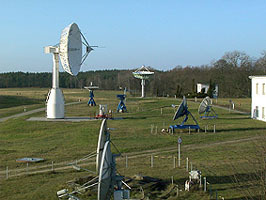 The bulk of CORONAS telemetry is received by Neustrelitz Satellite Ground station in Germany and automatically downloaded to IZMIRAN via Internet. 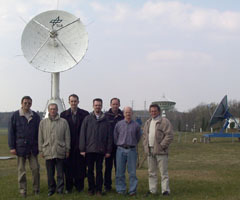 CKIT uses its own facilities to upload commands to CORONAS spacecraft (vertical mast on the left is the 2.4 GHz 15 dBi antenna of the wireless link to IZMIRAN). CKIT personnel performs operative control of the spacecraft and coordination of activity between Data Aquisition and preprocessing centers and groups of PI researchers.